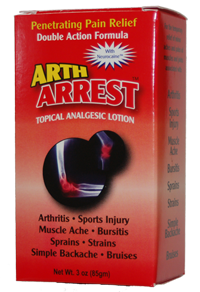 ArthArrestTM the Topical Analgesic Lotion that works! 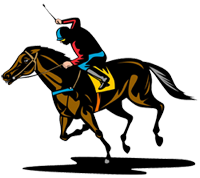 One of the active ingredients in ArthArrest TM Capsaicin has proven to be so effective in alleviating pain from inflammation that it is used to treat racehorses legs. If you have pain from Arthritis, Sports Injuries, Bursitis, Sprains or everday strains, ArthArrest TM is for you. ArthArrestTM is the "best possible over-the-counter topical pain relief for Arthritis" as well as other minor muscle aches and sprain injuries. A proven formula back on the market due to demand. Its not everyday a product gets such rave reviews but after using ArthArrest just once you'll see why! ArthArrest is used throughout the United States for the relief of pain from Arthritis, Bursitis, Simple Back and Muscle Aches, Sprains and Sports Injuries. Get your ArthArrest today, Order online for fast pain relief! From our humble beginings we have strived for a natural balance. Personal health care from nature. Products containing capsaicin may cause burning, stinging or tingling sensation where applied. This is a natural reaction and varies with each individual and usually decreases or disappears after continued use. ArthArrest may be removed from the test area by wiping rubbing alcohol.